This summer has been an extra busy time and it’s been impossible to find time to blog. 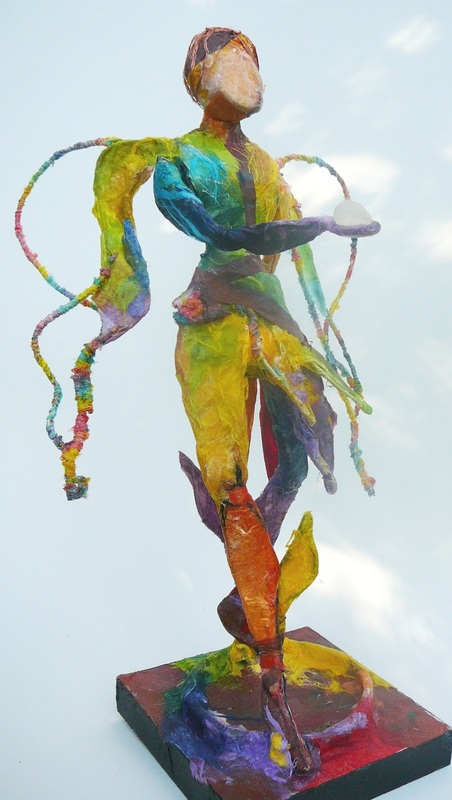 Still, today I finished a papier mâchè piece, Gifting Angel, created in preparation for the Papier Mâché Angels workshop to be held at the Coast Collective Arts Centre at Esquimalt Lagoon near Victoria BC. The workshop is not until Friday November 16, 2012 but it was time to begin to think about the workshop and to have a picture to post on the website.Though my interpretation of an angel is not very conventional, the process is easy to follow and the idea is to discover and form your own idea of an angel that reflects your ideas and beliefs. For me two of the ideas that flowed as I created; walking through a rainbow and openness to the gift of truth in all it’s complicated simplicity. Hi Eeefje. Thank you for your interest in an online doll workshop. I’ve thought about it but I wouldn’t be able to pull it off at present as I’m burnt out for teaching right now. Long story. Presently I am drawing. It’s a return to something I did before the dolls and need to re-explore for now. One thought… I may post some dolls and talk about the process, would that be helpful? Would keep the pressure of teaching responsibilities away from me but still share my process in a storytelling way. Hi Joy, I am sorry for my late response, a lot has happened here as well.. Thank you so much for your response! If you would still like to post some dolls and talk about your process, that would be very helpful and inspiring! I can imagine teaching responsibilities can become too much teaching also includes so much to do besides the actual teaching..
Take care of yourself and I am looking forward to hear your stories about some dolls, but no pressure! Thank you. 6 more months of teaching and then hopefully time for the dolls.